TOMORROW, the BBC shows the fourth episode in the new series of Doctor Who. "New series of Doctor Who". sorry to repeat myself but I just wanted to savour seeing that written down. Many people despaired of ever clapping eyes on the Doctor again but now he's back it's not just the geeks who have been impressed. The new series has been a big ratings success, wiping the smirks off Ant and Dec's faces three Saturday nights in a row. I predict they will soon be auditioning for parts in the show as Geordie Cybermen. But it's when a series is four episodes in and at the end of its honeymoon period you have to remember what's so good about it. So here goes: Doctor Who is clever, but never clever-clever. Unlike the BBC's other big budget drama Hustle, which is so smug it should have a trailer saying "Warning, this programme contains extended scenes of self-satisfaction". And considering it's a show about an alien travelling through time and space accompanied by Billie Piper it's only silly in moderation and makes some serious points. Most episodes are funnier than most sitcoms, one villain was a snobby piece of skin stretched over a frame and voiced by Zoe Wannamaker. Billie's character Rose ends one argument by calling her "A bitchy trampoline". The Welsh zombies in last week's episode must have had more people cowering behind the sofa than a late-night Ikea opening. Tomorrow's episode is the first of a two-part story and the only one of the series so far which isn't self contained. Aliens of London starts with a bang as an alien spaceship crash-lands in the city destroying Big Ben and finishing up in the Thames. You can see why writer Russell T Davies chose Big Ben, if the aliens had landed in the Tate Modem nobody would've noticed. From there the episode builds slowly to a cliffhanger ending. Along the way you will feel very sorry for a pig and wonder if they really got Tony Blair to appear in a non-speaking cameo. Such is the esteem the series is held in that real-life stars are queuing up to be in the show. Spaced and Shaun of the Dead star Simon Pegg is on the way and BBC newsman Andrew Marr plays himself tomorrow. Poor Andrew must have been excited at being asked to appear in a series he'd grown up with, but to see it was an episode entitled "Aliens of London" must have worried him. When the aliens are finally revealed they bear a certain resemblance to writer and executive producer Russell T Davies. The series has all this and there haven't even been any Daleks in it yet. The only bad news is that Christopher Eccleston has already dropped out of playing the Doctor for the next series. This will mean we all have to sit through more ridiculous speculation as to who should be Who. Last time contenders ranged from Richard E Grant (good) to Alan Davies (bad) to William Hague (ridiculous). But for the time being we can just enjoy the Time Lord for another 10 episodes. APA 6th ed. : Glover, Ben (2005-04-15). Destroy Ant and Dec!. South London Press . MLA 7th ed. : Glover, Ben. 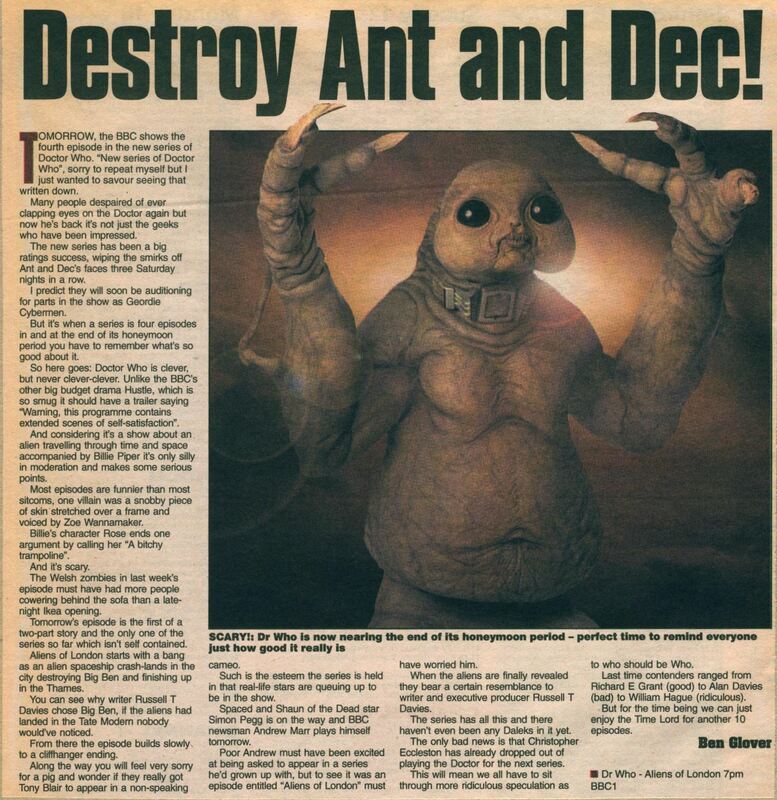 "Destroy Ant and Dec!." South London Press [add city] 2005-04-15. Print. Turabian: Glover, Ben. "Destroy Ant and Dec!." South London Press, 2005-04-15, section, edition. This page was last modified on 4 May 2016, at 23:02.